I worked on the lone star quilt in the morning. At lunch time I took it back off the machine. If I work on it a little at a time…. eventually it will get finished. This one went onto the machine. It will be going out to the owner by Friday. Monday at the latest. The owner has a deadline she needs to meet which is why I have a deadline to finish it. By bedtime I had it all stabilized and started choosing a stitching design for the border. 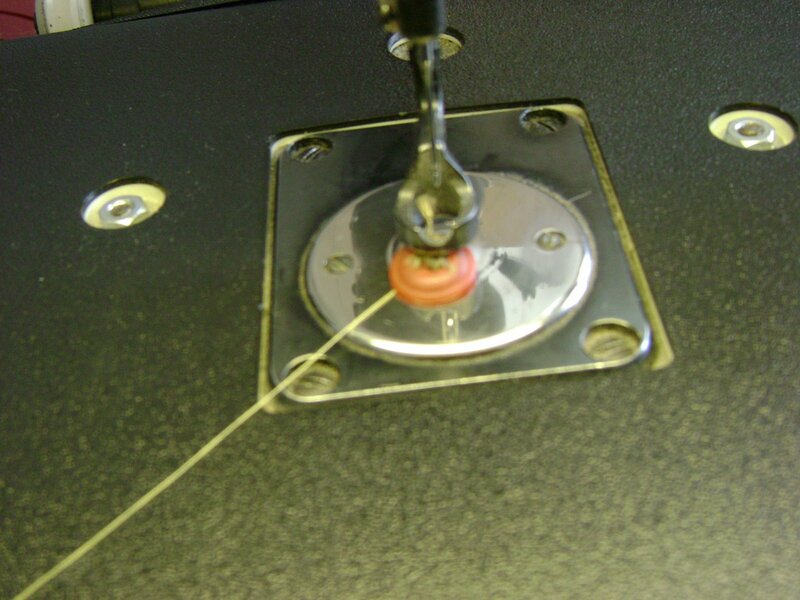 While doing the stitch in the ditch to stabilize; I moved my machine to bring up the bobbin thread and this happened. Somehow the foot went up onto a button. I’m thankful I wasn’t stitching because it could have caused the needle to break and the timing to be thrown off or some other problems. I had to cut the thread that held the button so I could move the machine off the quilt. The only way I could get the button out from under the foot was to loosen the nut that holds the foot and raise it. I was talking on the phone with one of my customers yesterday evening. She had called to say… “I’m not trying to rush you but could you possibly have my quilt finished by……” “Oh, and could you do heirloom quilting instead of custom?” I told her I would do my best and about how exhausted I sometimes get when I’m working so many hours without a break. I work 12 hours a day for 6 and sometimes 7 days a week. She tells me “Anita you really should cut your hours down to only 8 a day and take some days off.” I tell the customer…. I agree and I do my best to work less. Then I ask this customer….. So does that mean I can take some time off instead of getting your quilt done by the deadline? (hesitation and phone silence) She says “after you get mine done.” I giggle a little then ask her…. which one or more of my customers should I tell I can’t finish their quilt on time? The customer then tells me that maybe I shouldn’t book so many quilts. I agree again and explain I really didn’t plan on being behind schedule. I honestly did change my waiting list to be less than half the number of bookings I had last year. My intention was to have fewer tops to quilt so I could have more time off. I based my waiting list on what I believed would be a normal work day and work week. Little did I know that by the end of January my list would be completely filled for the whole year. After our conversation she understood a little better the difficulties of staying on schedule. So….. 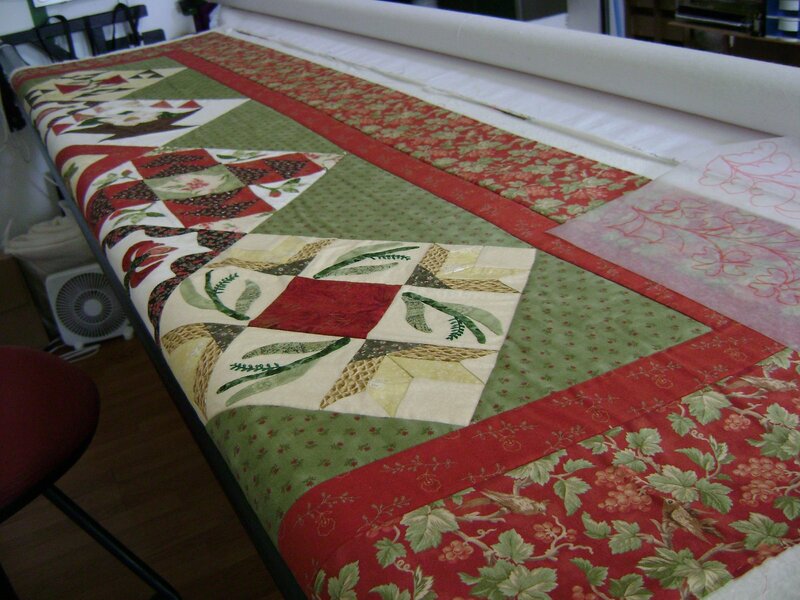 I have one more deadline to meet to finish her quilt before her deadline. Don’t you just HATE when they put the buttons and other embelishments on the quilt BEFORE you quilt it? I sure do. I get even antsier when they bring the quilt and TELL YOU.. oh, I have a few(?) buttons it.. I KNOW i shouldn’t.. but,, yada yada yada. And yes, I have had several of those “i don’t want to hurry you, BUT…” calls myself lately.. Oh my.. seems it never ends. 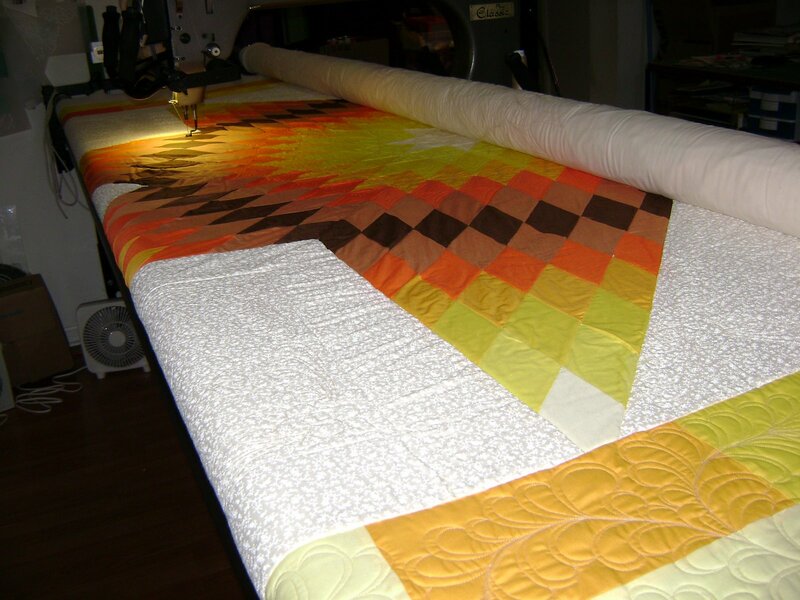 This entry was posted on April 23, 2009 by Anita in Being a professional quilter, Customer quilts 2009, Scheduling.